Crimean Congo hemorrhagic fever (CCHF) is one of the severe forms of hemorrhagic fever endemic in Africa, Asia, Eastern Europe and the Middle East with a near fatal mortality rate. CCHF not only forms an important public health threat but has a significant effect on the healthcare personnel, especially in resource-poor countries. India was always under the potential threat of CCHF viral infection until an outbreak hit parts of Gujarat, taking four lives including the treating medical team in recent past. With regard to questions on the importation of virus in the region, acquisition of virus by the index case and the viral status in India are yet to be revealed. The endemic potentiality of the country poses a challenge in controlling the CCHF viral infection not only for India but also for its neighboring countries. 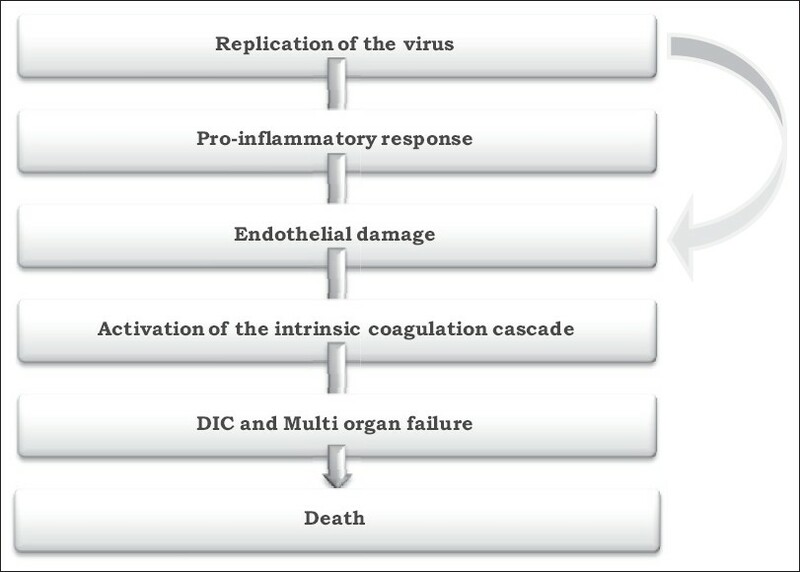 The present review is an attempt to summarize the updated knowledge on the disease. CCHF is a zoonotic viral disease caused by tick-borne virus Nairovirus (family Bunyaviridae). The disease has a wide distribution that correlates with the global distribution of Hyalomma tick, the vector responsible for viral transmission. The disease is generally asymptomatic in infected animals but highly fatal in humans. The disease in humans begins as non-specific febrile symptoms, which progress to hemorrhagic syndrome. Although tick is a major vector in transmission of the disease, further secondary cases are frequently seen due to human to human transmission via percutaneous or per mucosal exposure to blood and body fluids containing the virus. This uncommon transmission takes place most often among healthcare workers in hospital settings, thus posing a significant nosocomial hazard. Adhering to universal precautions while caring for patients, timely infection-control measures, and administration of prophylactic therapy to healthcare workers after exposure can serve as important measures in limiting the spread of infection. , However, additional community-based control measures such as use of pesticides to control tick population are necessary to decrease disease transmission and prevent further spread in the community. The geographic range of CCHF virus is the most extensive one among the tick-borne viruses that affect human health, and the second most widespread of all medically important arboviruses, after dengue virus. , Since its discovery in 1967, nearly 140 outbreaks involving more than 5,000 cases have been reported all over the world. A total of 52 countries have been recognized as endemic or potentially endemic regions, reporting substantial number of cases every year. The distribution of Hyalomma spp., the principal tick vector, also has wide distribution. CCHFV is mainly seen in the Middle East and Asia and parts of Europe including southern portions of the former Union of Soviet Socialist Republics (USSR). In the initial years after the virus was first described in 1967, a majority of cases were reported from the former Soviet Union (Crimea, Astrakhan, Rostov, Uzbekistan, Kazakhstan, Tajikistan) and Bulgaria. , In the years that followed, outbreaks were reported from parts of Africa such as the Democratic Republic of the Congo, Uganda, and Mauritania. , A significant number of cases were also reported from Middle Eastern countries such as Iraq,  the United Arab Emirates (UAE),  and Saudi Arabia. In the previous decade, most cases have been reported from Pakistan,  Iran,  Bulgaria,  Turkey, ,, and also India (from the outbreak in Gujarat). A majority of these outbreaks are seen in the community; also, contact with livestock animals infested with ticks is noted. However, in some outbreaks, nosocomial spread was documented where contact with blood and other body fluids from patients have been the main mode of transmission. Between 1953 and 2005, nearly 80 cases of CCHF infection have been described among healthcare personnel. [Table 1] shows the nosocomial outbreaks of CCHF observed during the past few years. Individuals who come in direct contact with the patient, such as clinicians, nurses and other hospital staff, are at a greater risk. This happens more when the knowledge about the disease is lacking. Thus, it becomes essential to train healthcare personnel in endemic and potentially endemic regions to manage such situations in order to minimize the nosocomial spread of the infection. Emphasis on standard and universal precautions should be given, especially in resource-poor countries. India: CCHF viral infection had not been reported in humans from India before, though previous seroprevalence studies have shown viral antibodies both in animals and humans. In 1973, Shanmugam et al., in their study, tested a total of 643 human sera from all over India; of these, nine samples from Kerala and Pondicherry were positive for anti-CCHF virus antibody. In the same study, 34 of 655 serum samples collected from sheep, horse, goat, and domestic animals from all over India showed evidence of CCHF virus. Subsequently, in 1977, Kaul et al., conducted a survey of ixodid ticks to determine the Crimean hemorrhagic fever (CHF) virus activity in Jammu and Kashmir state of India, but CCHF virus was not isolated in any of the 138 pools comprising eight species under six genera of ticks. However, a related species of the genus Nairovirus - Ganjam virus - that belongs to the Nairobi Sheep group is transmitted locally by Hemaphysalis ticks. This virus has veterinary importance in India and has been demonstrated in mosquitoes, man, and sheep. The recent outbreak of CCHF viral infection in Gujarat is the first notable report from India. The striking feature of this outbreak was high fatality and rapid spread among treating medical team. Humans are infected by the bite of or by crushing an infected tick of the Hyalomma spp., against bare skin. The infection can also be acquired by percutaneous and permucosal route by contact with animal blood or tissues and drinking unpasteurized milk. The possibility of aerosol transmission is suspected in few cases in Russia, but no definite evidence exists. Human-to-human transmission is possible and is an important route in a nosocomial set up when skin or mucous membranes are exposed to blood and body fluids of patients with hemorrhage [Figure 1]. In addition, possible horizontal transmission from a mother to child has been reported. The CCHF virus circulates in an enzootic tick-vertebrate-tick cycle. However, there is no evidence that the virus causes disease in animals. Wide range of domestic and wild animals may get CCHF virus infection. The virus infection has been commonly demonstrated among smaller wildlife species-eg, hares and hedgehogs that harbor the tick vectors that are at immature stages. , These small animals are believed to act as amplifying hosts and maintain the virus in nature. This virus has been found in around 31 species of ticks in seven genera of the family Ixodidae (hard ticks). Among the various genera of family Ixodidae, the most efficient and common vectors for CCHF appear to be members of the Hyalomma genus. Other ixodid ticks including members of the genera Rhipicephalus, Boophilus, Dermacentor, and Ixodes may also transmit the virus. These vectors have both trans-ovarial and trans-stadial transmission of virus, thus contributing to circulation of the virus in nature by remaining infected throughout their developmental stages and also by passing to the next generation. Immature ticks (nymphs) generally inhabit smaller animals, while mature ticks transmit the infection to large vertebrates such as livestock. The genome of family Bunyaviridae is tripartite and consists of three segments of negative-sense, single-stranded RNA, small (S), medium (M), and large (L), which encode the nucleocapsid protein, glycoproteins (Gn and Gc), and viral polymerase, respectively. Additionally, an M segment-encoded nonstructural protein, NSM, has recently been identified in the Nairovirus-Crimean-Congo Hemorrhagic Fever Virus (CCHFV). Initially, the antigenic structures of CCHF viruses from various geographical regions were thought to be indistinguishable. With the availability of nucleotide and amino acid sequence information, extensive genetic diversity has been shown in these viruses. Most nucleic acid sequence analyses are based on the S segment of the genome and, according to these studies, the CCHF virus comprises eight genetically distinct clades [Table 2]. The knowledge of various clades of CCHF virus has great epidemiological implications. These can provide clue regarding the source of infection during an outbreak in an endemic region and also help in tracing the path of spread of imported cases. The significant antigenic differences among various clades should be considered while choosing the target for vaccine. The pathogenesis of CCHF is not well understood. A common pathogenic feature of hemorrhagic fever viruses is their ability to disable the host immune response by attacking and manipulating the cells that initiate the antiviral response. This damage is characterized by rapid replication of the virus along with dysregulation of the vascular system and lymphoid organs. As seen in other viral hemorrhagic fevers, damage to the endothelium plays an important role in CCHF pathogenesis. This further leads to hemostatic failure by stimulating platelet aggregation and degranulation, with subsequent activation of the intrinsic coagulation cascade [Figure 2]. Marked pro-inflammatory response disproportional to the extent of lesion is a striking feature seen in these patients. The proinflammatory cytokines are key regulators in the pathogenesis and mortality of patients with CCHF. Levels of Interleukin (IL)-6 and Tumor Necrosis Factor (TNF)-α are shown to be significantly higher in patients with fatal CCHF as compared to those with non-fatal infection. Early diagnosis is an essential requirement, not only for patient management but also for prevention of further transmission of disease, as it has the potential for nosocomial spread. A high index of suspicion is necessary in the early phase because the clinical presentations are nonspecific. History of travel to endemic areas, tick bite, and exposure to blood or tissues of livestock or human patients are key pointers to suspect CCHF viral infection. The important differential diagnoses for CCHF viral infection are bacterial infections such as rickettsiosis (tick-borne typhus and African tick bite fever), leptospirosis, and borreliosis (relapsing fever) as well as other infections, which present as hemorrhagic disease such as meningococcal infections, Hantavirus hemorrhagic fever, malaria, yellow fever, dengue, Omsk hemorrhagic fever, and Kyasanur Forest disease. Knowledge of endemicity of these infections should be kept in mind to proceed with further diagnostic modalities. The most definitive way of diagnosis is the demonstration of virus or viral genome. Isolation by cell culture is simpler and rapid as compared with traditional methods of intracerebral inoculation of a sample in newborn mice. Viral isolation is done by using cell lines such as LLC-MK2, Vero, BHK-21, and SW-13.4 and can be achieved in 2-5 days. CCHF virus generally produces no or little cytopathic effect and can be identified by immunofluorescence assay with specific monoclonal antibodies. However, viral isolation is useful only in the early phase of infection when the viral load is high but suffers from poor sensitivity; moreover, this can be done only if the biosafety level 4 containment facilities are available. However, a systematic meta-analysis showed no change in mortality rate with the use of ribavirin in the randomized control studies, while pooled observational studies showed reduction in mortality by 44%. In addition, no difference in length of hospital stay was reported. Thus, no clear message of benefit is available from the current data on ribavirin, as observational data are heavily confounded. These results clearly indicate the need for randomized control studies in a setting with optimal supportive care. According to World Health Organization (WHO), ribavirin is the anti-viral medication of choice for CCHF and the recommended dose is an initial dose of 30 mg/kg followed by 15 mg/kg for four days and then 7.5 mg/kg for six days for a total of 10 days. In case of known direct contact with blood or secretions of a probable or confirmed case such as needlestick injury or contact with mucous membranes such as eye or mouth, the recommended procedure is to carry out baseline blood studies and start the patient on oral ribavirin. The direct or indirect contacts of cases should be monitored for 14 days from the date of last contact with the patient or other source of infection by recording the temperature twice daily. If the patient develops a temperature of 38.5°C or higher, headache, and muscle pains, he/she must be considered a probable case, admitted to hospital, and started on ribavirin treatment. Experience with ribavirin in the prevention of CCHF is substantially limited, as compared to other viral hemorrhagic fever, eg, Lassa fever. According to Centers for Disease Control and Prevention (CDC), the in vitro susceptibility data of ribavirin in CCHF and other Bunyaviridae supports the use of ribavirin both for treatment and prophylaxis in high-risk contacts. The CDC recommends that similar procedures for care, including isolation and body fluid precautions and therapy, recommended for Lassa fever be followed for patients with CCHF and their contacts; however, additional study and experience is required. The major hindrance in developing vaccine against CCHF virus is the great genetic variation noted in different strains. Despite this genetic variability, Ahmed et al. have shown that some epitopes are conserved, and CCHFV vaccines may have to be either immunogens derived from several CCHFV strains, or can target the immune response on conserved neutralizing epitopes. An inactivated vaccine derived from mouse brain has been used in the former Soviet Union and Bulgaria. However, in most of the countries vaccine is not available. CCHF was always an impending threat to India, which has now become a reality with the current outbreak in Gujarat. The vector and reservoir animals were already present. The related species of the genus Nairovirus, eg, Ganjam virus of Nairobi sheep disease, is also transmitted by same vector as CCHF virus and has been reported previously. The emergence of this deadly viral infection in a huge country like India having all ecological suitability for the virus is a challenge for the entire medical fraternity. This emphasizes the need for active surveillance not only for existing pathogens in any geographic location but also for those that pose future threat. The use of molecular techniques even for surveillance is of paramount importance for preventing further spread of this highly pathogenic virus. 1. Lacy MD, Smego RA. Viral hemorrhagic fevers. Adv Pediatr Infect Dis 1996;12:21-53. 2. Weber DJ, Rutala WA. 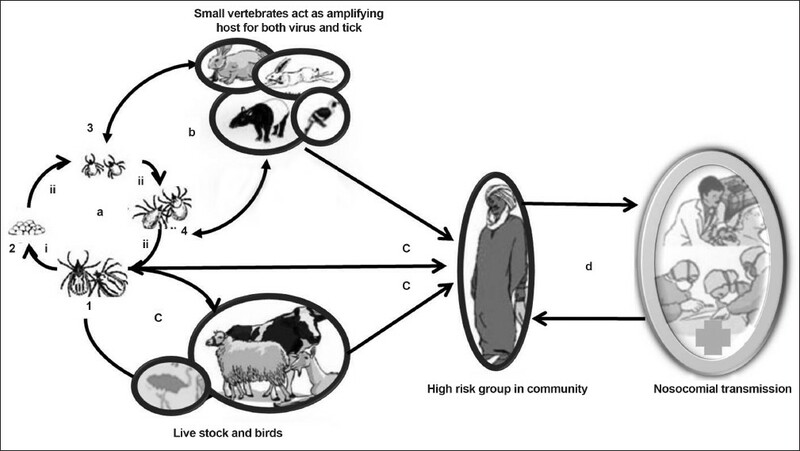 Risks and prevention of nosocomial transmission of rare zoonotic diseases. Clin Infect Dis 2001;32:446-56. 3. Centers for Disease Control (CDC). Management of patients with suspected viral hemorrhagic fever. MMWR Morb Mortal Wkly Rep 1988;37 Suppl 3:1-16. 4. Hoogstraal H. The epidemiology of tick borne Crimean-Congo hemorrhagic fever in Asia, Europe and Africa. J Med Entomol 1979;15:307-417. 5. Watts DM, Ksiazeck TG, Linthicum KJ, Hoogstraal H. Crimean-Congo hemorrhagic fever. In: Monath TP, editor. The Arboviruses: Epidemiology and Ecology. Florida: CRC Press; 1988. p. 177-222. 6. Simpson DI, Knight EM, Courtois G, Williams MC, Weinbren MP, Kibukamusoke JW. Congo virus: A hitherto undescribed virus occurring in Africa. I. Human isolations-clinical notes. East Afr Med J 1967;44:86-92. 7. Ergönül O. Crimean-Congo haemorrhagic fever. Lancet Infect Dis 2006;6:203-14. 8. Swanepoel R, Shepherd AJ, Leman PA, Shepherd SP, McGillivray GM, Erasmus MJ, et al. Epidemiologic and clinical features of Crimean-Congo hemorrhagic fever in southern Africa. Am J Trop Med Hyg 1987;36:120-32. 9. Saluzzo JF, Aubry P, McCormick J, Digoutte JP. Haemorrhagic fever caused by Crimean Congo haemorrhagic fever virus in Mauritania. Trans R Soc Trop Med Hyg 1985;79:268. 10. Al-Tikriti SK, Al-Ani F, Jurji FJ, Tantawi H, Al-Moslih M, Al-Janabi N, et al. Congo/Crimean haemorrhagic fever in Iraq. Bull World Health Organ 1981;59:85-90. 11. Schwarz TF, Nsanze H, Ameen AM. Clinical features of Crimean-Congo haemorrhagic fever in the United Arab Emirates. Infection 1997;25:364-7. 12. el-Azazy OM, Scrimgeour EM. Crimean-Congo haemorrhagic fever virus infection in the western province of Saudi Arabia. Trans R Soc Trop Med Hyg 1997;91:275-8. 13. Sheikh AS, Sheikh AA, Sheikh NS, Rafi-U-Shan, Asif M, Afridi F, et al. Bi-annual surge of Crimean-Congo haemorrhagic fever (CCHF): A five-year experience. Int J Infect Dis 2005;9:37-42. 14. Sharifi Mood B, Alavi-naini R, Metanat M. Ten years after the beginning of Crimean-Congo hemorrhagic fever outbreak in Iran: A promising report. Iran J Clin Infect Dis 2009;4:189-93. 15. Papa A, Christova I, Papadimitriou E, Antoniadis A. Crimean-Congo hemorrhagic fever in Bulgaria. Emerg Infect Dis 2004;10:1465-7. 16. Ergonul O, Celikbas A, Dokuzoguz B, Eren S, Baykam N, Esener H. Characteristics of patients with Crimean-Congo hemorrhagic fever in a recent outbreak in turkey and impact of oral ribavirin therapy. Clin Infect Dis 2004;39:284-7. 17. Karti SS, Odabasi Z, Korten V, Yilmaz M, Sonmez M, Caylan R, et al. Crimean-Congo hemorrhagic fever in Turkey. Emerg Infect Dis 2004;10:1379-84. 18. Bakir M, Ugurlu M, Dokuzoguz B, Bodur H, Tasyaran MA, Vahaboglu H, et al. Crimean-Congo haemorrhagic lever outbreak in Middle Anatolia: A multicentre study of clinical features and outcome measures. J Med Microbiol 2005;54:385-9. 19. Christova I, Di Caro A, Papa A, Castilletti C, Andonova L, Kalvatchev N, et al. Crimean-Congo hemorrhagic fever, southwestern Bulgaria. Emerg Infect Dis 2009;15:983-5. 20. Aradaib IE, Erickson BR, Mustafa ME, Khristova ML, Saeed NS, Elageb RM, et al. Nosocomial outbreak of Crimean-Congo hemorrhagic fever, Sudan. Emerg Infect Dis 2010;16:837-9. 21. Uyar Y, Carhan A, Albayrak N, Altaº AB. Evaluation of PCR and ELISA-IgM results in the laboratory diagnosis of Crimean-Congo haemorrhagic fever cases in 2008 in Turkey. Mikrobiyol Bul 2010;44:57-64. 22. Naderi HR, Sarvghad MR, Bojdy A, Hadizadeh MR, Sadeghi R, Sheybani F. Nosocomial outbreak of Crimean-Congo haemorrhagic fever. Epidemiol Infect 2010;27:1-5. 23. ProMED-mail. Crimean-Congo hem. Fever - Kazakhstan: (SK) ProMED-mail 2009;15 Jul: 20090715.2529. Available from: http://www.promedmail.org. [Last accessed on 2011 Feb 16]. 24. ProMED-mail. Crimean-Congo hem. fever - Tajikistan: (TC). ProMED-mail 2009;15 Aug: 20090815.2898. Available from: http://www.promedmail.org. [Last accessed on 2011 February 16]. 25. ProMED-mail. Undiagnosed hemorrhagic fever, fatal-India: (GJ) RFI. ProMED-mail 2011; 18 Jan: 20110118.0211. Available from: http://www.promedmail.org. [Last accessed on 2011 February 16]. 26. Shanmugam J, Smirnova SE, Chumakov MP. Presence of antibody to arboviruses of the Crimean Haemorrhagic Fever-Congo (CHF-Congo) group in human beings and domestic animals in India. Indian J Med Res 1976;64:1403-13. 27. Kaul HN, Shetty PS, Ghalsasi GR, Dhanda V. Survey of ticks (Acarina: Ixodidae) for Crimean haemorrhagic fever virus activity in Jammu and Kashmir state, India. Indian J Med Res 1990;91:5-8. 28. Sudeep AB, Jadi RS, Mishra AC. Ganjam virus. Indian J Med Res 2009;130:514-9. 29. Elliott RM, Bouloy M, Calisher CH, Goldbach R, Moyer JT, Nichol ST, et al. Family Bunyaviridae. In: van Regenmortel MHV (editors). Virus Taxonomy: Classification and Nomenclature of Viruses. Seventh Report of the International Committee on Taxonomy of Viruses. San Diego: Academic Press; 2000. p. 599-621. 30. Whitehouse CA. Crimean-Congo hemorrhagic fever. Antiviral Res 2004;64:145-60. 31. Papa A, Bino S, Llagami A, Brahimaj B, Papadimitriou E, Pavlidou V, et al. Crimean-Congo hemorrhagic fever in Albania, 2001. Eur J Clin Microbiol Infect Dis 2002;21:603-6. 32. Papa A, Papadimitriou E, BoŸoviæ B, Antoniadis A. Genetic characterization of the M RNA segment of a Balkan Crimean-Congo hemorrhagic fever virus strain. J Med Virol 2005;75:466-9. 33. Yashina L, Vyshemirskii O, Seregin S, Petrova I, Samokhvalov E, Lvov D, et al. Genetic analysis of Crimean-Congo hemorrhagic fever virus in Russia. J Clin Microbiol 2003;41:860-2. 34. Yashina L, Petrova I, Seregin S, Vyshemirskii O, Lvov D, Aristova V, et al. Genetic variability of Crimean-Congo haemorrhagic fever virus in Russia and central Asia. J Gen Virol 2003;84:1199-206. 35. Franz DR, Jahrling PB, Friedlander AM, McClain DJ, Hoover DL, Bryne WR, et al. Clinical recognition and management of patients exposed to biological warfare agents. JAMA 1997;278:399-411. 36. Ozkurt Z, Kiki I, Erol S, Erdem F, Yilmaz N, Parlak M, et al. Crimean-Congo hemorrhagic fever in Eastern Turkey: Clinical features, risk factors and efficacy of ribavirin therapy. J Infect 2006;52:207-15. 37. Sannikova IV, Pacechnikov VD, Maleev VV. Respiratory lesions in Crimean-Congo hemorrhagic fever. Ter Arkh 2007;79:20-3. 38. Doganci L, Ceyhan M, Tasdeler NF, Sarikayalar H, Tulek N. Crimean-Congo hemorrhagic fever and diffuse alveolar haemorrhage. Trop Doct 2008;38:252-4. 39. Ergonul O, Tuncbilek S, Baykam N, Celikbas A, Dokuzoguz B. Evaluation of Serum Levels of Interleukin (IL)-6, IL-10, and tumor necrosis factor-alpha in patients with Crimean-Congo hemorrhagic fever. J Infect Dis 2006;193:941-4. 40. Drosten C, Kummerer BM, Schmitz H, Gunther S. Molecular diagnostics of viral hemorrhagic fevers. Antiviral Res 2003;57:61-87. 41. Shepherd AJ, Swanepoel R, Leman PA. Antibody response in Crimean-Congo haemorrhagic fever. Rev Infect Dis 1989;11:801-6. 42. Casals J, Tignor GH. Neutralization and hemagglutination-inhibition tests with Crimean hemorrhagic fever-Congo virus. Proc Soc Exp Biol Med 1974;145:960-6. 43. Swanepoel R, Struthers JK, McGillivray GM. Reversed passive hemagglutination and inhibition with Rift Valley fever and Crimean-Congo haemorrhagic fever viruses. Am J Trop Med Hyg 1983;32:610-7. 44. Charrel RN, Attoui H, Butenko AM, Clegg JC, Deubel V, Frolova TV, et al. Tick-borne virus diseases of human interest in Europe. Clin Microbiol Infect 2004;10:1040-55. 45. Saijo M, Qing T, Niikura M, Maeda A, Ikegami T, Prehaud C, et al. Recombinant nucleoprotein-based enzyme-linked immunosorbent assay for detection of immunoglobulin G antibodies to Crimean-Congo hemorrhagic fever virus. J Clin Microbiol 2002;40:1587-91. 46. Saijo M, Tang Q, Shimayi B, Han L, Zhang Y, Asiguma M, et al. Recombinant nucleoprotein-based serological diagnosis of Crimean-Congo hemorrhagic fever virus infections. J Med Virol 2005;75:295-9. 47. Tasdelen Fisgin N, Ergonul O, Doganci L, Tulek N. The role of ribavirin in the therapy of Crimean-Congo hemorrhagic fever: Early use is promising. Eur J Clin Microbiol Infect Dis 2009;28:929-33. 48. Soares-Weiser K, Thomas S, Thomson G, Garner P. Ribavirin for Crimean-Congo hemorrhagic fever: systematic review and meta-analysis. BMC Infect Dis 2010;10:207. 49. Vassilenko SM, Vassilev TL, Bozadjiev LG, Bineva IL, Kazarov GZ. Specific intravenous immunoglobulin for Crimean-Congo haemorrhagic fever. Lancet 1990;335:791-2. 50. Flick R, Whitehouse CA. Crimean-Congo hemorrhagic fever virus. Curr Mol Med 2005;5:753-60. 51. Smego RA Jr, Sarwari AR, Siddiqui AR. Crimean-Congo hemorrhagic fever: Prevention and control limitations in a resource poor country. Clin Infect Dis 2004;38:1731-5. 52. Ahmed AA, McFalls JM, Hoffmann C, Filone CM, Stewart SM, Paragas J, et al. Presence of broadly reactive and group-specific neutralizing epitopes on newly described isolates of Crimean-Congo hemorrhagic fever virus. J Gen Virol 2005;86:3327-36. 53. Papa A, Papadimitriou E, Christova I. The Bulgarian vaccine Crimean-Congo haemorrhagic fever virus strain. Scand J Infect Dis 2011;43:225-9.